Described as a performer who “has her audience enthralled throughout the entire show” (Thornbury Paper), a musician who sings as if she is “reciting poetry” (Meaford Express), and “a talented jazz and ballad singer with an attractive voice and subtle improvising style” (Scott Yanow), Mary-Catherine Pazzano is a jazz vocalist based in Kitchener, Ontario. Mary-Catherine’s performance highlights include: Birdland (New York City), Uptown Waterloo Jazz Festival, The Rex (Toronto), Jazz Bistro (Toronto), The Jazz Room (Waterloo), and The Registry Theatre (Kitchener). She has also toured New Zealand as a lead vocalist, and has been a soloist with the Kitchener-Waterloo Symphony. Mary-Catherine has shared the stage with jazz notables Mark Eisenman and Pat Collins, as well as the world-class chamber ensemble Penderecki String Quartet. 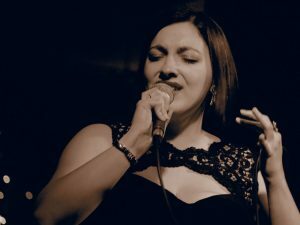 Mary-Catherine has also made a name for herself in smaller pockets of Ontario, as a regular at Collingwood’s Jazz at the Library Series and a headliner with the Canadian Big Band Celebration (Port Elgin). Mary-Catherine completed her Bachelor of Arts in Music and Drama from the University of Waterloo in 2010, as well as her Bachelor of Education from University of Toronto in 2012. Shortly thereafter, she focused her attention to a performance career. When Mary-Catherine isn’t performing, she is committed to using her performance experience in an educational capacity. She operates a voice studio, and is Founder and Artistic Director of Jazz in the Schools, a program dedicated to bringing music education to high school students in need of a creative outlet. She also founded and directs Jazz for Adults, a program designed for older adults to realize their passion for singing and playing jazz in a collaborative, encouraging atmosphere. Mary-Catherine released her debut studio album, “You’re Gonna Hear From Me” on October 27, 2017, on the label Glorious Feeling Records. The album contains original songs, material from the Great American Songbook, and lesser known jazz standards. The album has received radio airplay on JazzFM, CBC, community and commercial radio stations across Ontario, Québec, British Columbia, Saskatchewan, and nationally syndicated U.S. shows in Florida, California, and Minnesota. Songs from the album have also been added to CBC’s worldwide Jazz Songbook Stream on cbcmusic.ca. The album received a rave review in the December issue of The WholeNote Magazine. I’ve done some work editing photos from the Jazz Camp performances. There are quite a few, but I hope I was able to take some nice photos, particularly of the singers. I regret that I only took a few of you and Don, and they aren’t very good ones, but I was concentrating on the participants. A second regret is that I forgot that some of the instrumentalists were students as well. I wish I had focused more on them, even with the music stands blocking the way. I can send you a link to the photos in Google Photos, which you could share with the participants. Alternately, I have created a “secret” Facebook group where I can post the pictures as well. I’m not sure what the level of technology is for the participants and which would be easier. Finally, I’m glad to facilitate prints of any of the shots if anyone is interested. Are you able to share the photos via a Google Drive link or Google Photos, and then I can distribute to the participants? Thank you so much for all your effort, with taking them, editing them, and then willing to share them!